First up is a new installment of the classic Greyhawk's World articles reinvigorated by Greyhawk Grognard. This time he covers events of the Central Flanaess namely lands such as Dyvers, Urnst, Wild Coast and yes Greyhawk itself. Check it out and download this well written document for use in your own campaign! Next up at Wizards is the Podcast of Foes. This is a series of RPG podcasts covering the release of Mordenkainen's Tome of Foes. Take note my friends at Return to Greyhawk, a live stream show, is the anchor for this two week parade of podcasts. Should be interesting! Check out this calendar of shows and times for more info. 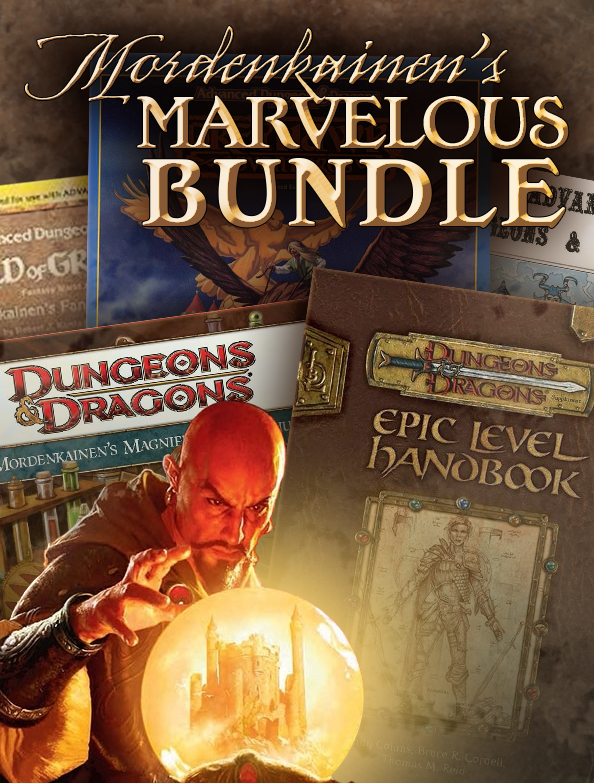 Lastly over at Drive Thru RPG they are doing Mordenkainen's Marvelous Bundle. 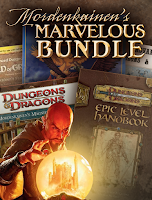 This set of PDfs includes Mordy related products from all editions of D&D! Check it out if you don't already own these books. Oh that Mordenkainen, what a shill! More next time. Hail Greyhawkers! Light blog day for me folks as I'm too busy doing real life work-stuff. Today I'm promoting Vile & Villainous again on the Greyhawk Channel. And also again, I'd like to mention Deven Rue is working on a Greyhawk map. Here is a sneak peak at the prelim sketch. Looks good so far! I can't wait to see her ink work and color, you'll be amazed how it turns out. Follow Deven on Twitter to see more of her work, and subscribe to the Greyhawk Channel community so you can get in on some wacky game discussions on their Discord group. Hey Greyhawkers! I'm a day late but I'm here to promote the Greyhawk Channel's latest new campaign on Twitch, Vile & Villainous where the players get to be shady characters in the service of the Land of Iuz. This particular show includes my good friend Boshie who is also an entertaining video game and IRL streamer. Check out her channel. The "evil" party also includes map maker extraordinaire, Deven Rue. What sort of trouble will they get into? Only time will tell. Tune in Mondays! In the meantime check the Greyhawk Channel and watch their videos of the day. Poll Result: Which Monster Should Attack? Hey Greyhawkers! Today I'm going over the results of my last poll Which Monster Should Attack Town? This was an easy-going fun poll, not much to do with Greyhawk per se, but we can analyze where these monstrous threats are coming from if you as a DM want to shake up your campaign. Let's go! Coming in tied for first (30%) is the two most popular mega-monsters, the Red Dragon and the king of D&D monsters the Tarrasque. Red dragons are of course the evil, fire breathing variety and are generally the strongest in most fantasy literature and art. The tarrasque is a unique creature which like a dragon, slumbers and comes out to feed and destroy towns before going dormant again. The only difference between the two is red dragons want your treasure, the tarrasque just wants to kill anything that moves. As for red dragons, there is plenty in Greyhawk canon to draw from if you want a Tolkienesque Smaug-level threat. The main bad dragon is Brazzemal the Bright who can be found either in the Hellfurnaces or in the Rift Canyon depending on your source, he is first seen in Hall of the Fire Giant King. There is Farcluun a rather intelligent yet powerful red found in the dungeons of the Greyhawk Ruins. Finally, there is another epic red in the Crystalmist Mountains named Sulphacitezus from the book Treasures of Greyhawk. All of these dragons can make a cunning and ultra-deadly foe for PCs and a terror on any towns nearby. Coming in second with 16% of the vote is the surprising Roc! For those who don't know, a roc is a gigantic bird of prey known from mythology often depicted carrying off an elephant in its talons. It is featured in the popular fiction The Arabian Nights encountered by Sinbad the sailor. In Greyhawk fiction I believe there is a roc on the cover of Dungeonland. So yes, this is Rodan-level death from above for monster buffs out there. Where to use a Roc? This one could go many directions too. Given the roc's mythological background it would fit best in the warm Baklunish culture preying on ships sailing the Dramidj Ocean or perhaps picking off caravans crossing the Dry Steppes. In the east Flanaess, a roc can easily roost in any mountainous areas near the Azure Sea or Solnor Ocean. It's a top of the food chain monster, probably only threatened by dragons and mankind. In the most extreme case, a roc could threaten your local villagers used as a flying mount for a cloud giant. That's double trouble! Next in line with 10% of the vote is the Purple Worm! This is just what you think it is, a colossal sized worm that burrows and swallows whole everything in its way including unwitting heroes. The purple worm is an iconic D&D creature featured in the Monster Manuals from way back, it is often seen in the Underdark and not on the surface however. This doesn't mean a DM can't lure one to the surface though. A confused hungry purple worm on above ground is just as deadly. Where to use a Purple Worm? The first place I can find them on the World of Greyhawk encounter charts is the Sea of Dust. This immediately brings up images of Dune's sand worms. That begs the question, can purple worms be domesticated as a mount by some intelligent species to invade outside the desert? You're welcome evil-DMs. Ideally however, they can be found near any dungeon ruin, ready to creep up looking for new sources of food. Speaking of giant things, coming in with 8% of the vote is a Titan. Again, this is a mythological giant, even greater in size and strength than even storm giants. A titan is supposed to be a near god-like being and are typically represented in D&D as being in Greek-garb and have special abilities according to their sphere of interest. While not generally evil, an enraged titan could be trouble for a town either directly or collaterally. Lastly and most surprisingly at 6% last is the Kraken! No not the monster from Clash of the Titans, I'm talking the one we all know about, the colossal intelligent squid kind. With its size and giant reaching tentacles, the kraken would be the most awful terrible and epic creature to unleash on a small harbor town. If the tarrasque rules land, then surely the kraken (is that singular or plural?) rules the deep oceans. Where to use a Kraken? In canon Greyhawk has/had a kraken in Grendep Bay near the barbarian lands. The town of Krakenheim is derived from this tale. If there is giant squids in the cold north, then surely there some in the vast deeps of the Azure Sea ready to be called up by evil such as sahuagin to wreck havoc on cities like Irongate or Gradsul. Or maybe your PCs are into high seas exploration off the map into the tropics? Well then there is definitely some krakens out there, ready to haul down a ship or terrorize the local natives. *No, really, do not play Doomgrinder what ever you do! It will wreck your campaign and is in general a huge waste of time. Whatever your choice of monster, remember the long lasting effect they can have on your campaign could be significant. Players, beware and behave! Good day Greyhawk fans! I don't have any new content myself this week, but I can surely point you toward a few outlets of Greyhawk fun and information in case you missed it. Ready? Over at Greyhawk Grognard is a great series finishing Kuntz and Gygax's "Greyhawk's World" updates from Dragon Magazine that were left hanging so many years ago. First was the Sheldomar Valley, followed by the more recent West Central Flanaess. It's top notch, seamless work, trust me check it out if you are interested in the political and military milieu of Greyhawk. 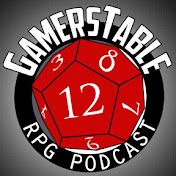 Next up is my friends at the Greyhawk Channel. They keep growing and growing with more shows and a burgeoning fanbase. All the campaigns are interconnected as well. The most recent additions are Mordenkainen's Path of the Planes an "epic plane-hopping adventure from the master of mages" which is timed with the upcoming release of Mordenkainen's Tome of Foes. Also there is DMShane's biggest challenge yet, an all evil group in Vile and Villanous "wicked fun in the World of Greyhawk". I don't know how TGC juggles all these games and players, but kudos to these folks for having the desire and energy to play in our favorite setting on a regular basis. Support them by following, subscribing an maybe even joining in the fun on their Discord. There is also a Youtube channel where you can watch past episodes. Enjoy! Lastly, if you haven't already, join the Canonfire! group on Facebook. It's under new administration and is growing fast! For those who have never been to Canonfire! 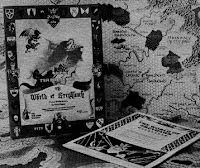 it is the oldest fan site dedicated to Greyhawk on the internet with features like articles, a Greyhawk wiki and active forums. Support your fellow fans and visit both these Canonfire! sites.